Dinuclear-thiolato bridged arene ruthenium complexes inhibit the apicomplexan N. caninum proliferation with low IC50 values of up to 1 nM, but do not affect human foreskin fibroblast (HFF) host cells at dosages of 5 µM and above. 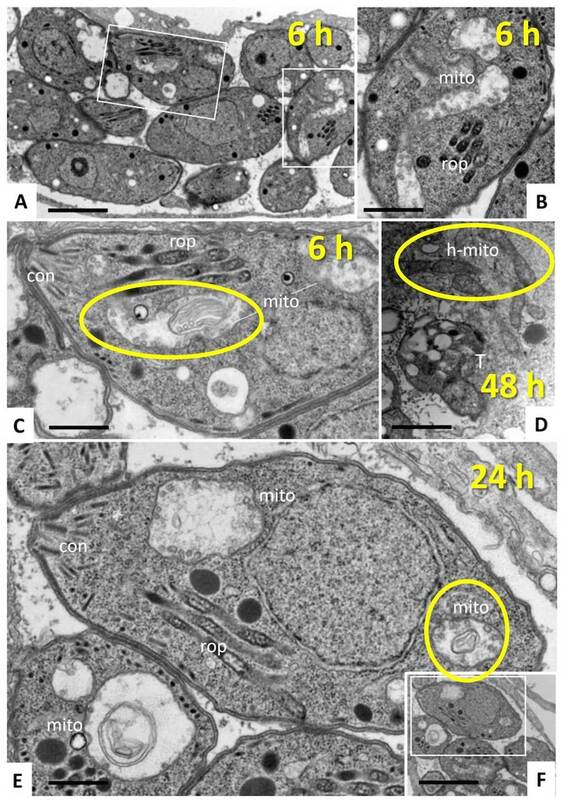 Biodistribution analysis using inductively coupled plasma mass spectrometry (ICP-MS) and transmission electron microscopy (TEM) showed that the parasite mitochondrion is the primary target in N. caninum tachyzoites. This work was carried out in the group of Prof. Julien Furrer. "Targeting of the mitochondrion by dinuclear thiolato-bridged arene ruthenium complexes in cancer cells and in the apicomplexan parasite Neospora caninum"
Metallomics, 2019, in press; doi:10.1039/c8mt00307f.